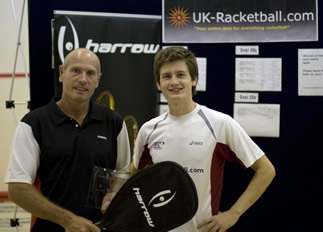 Last Saturday saw the second event in the 2010 Harrow UK-Racketball Series head to Esporta in Croydon for another intense day of Racketball. 15 of the players who had played in Nottingham a couple of weeks before were in the field including 3 of the 4 grade winners, Dominic Hamilton in the A, Rob Watkins in the over 40s and Mike Philips in the over 50s. 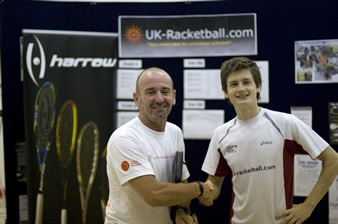 But once again there was stiff competition with Neil Chambers (England no. 7) entered into the A field and Steve Wall (runner-up in the over 45 nationals) present. In the first round of the A both the 2nd and 3rd seeds were troubled. With Dominic Hamilton coming through a tough 2-0 against Adrian Morris (11/7, 13/11) and Mark Fuller just taking a long tie break in the 1st game against Ben Brown before dropping the 2nd 11-4 and having to really dig deep to stay in the competition. 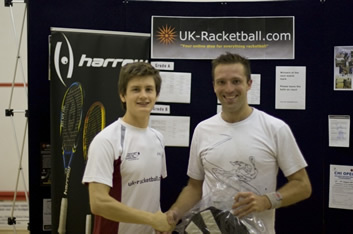 Neil Chambers came through unscathed against Adam Jamison taking the first game easily and the second even easier. 11/4, 11/1. 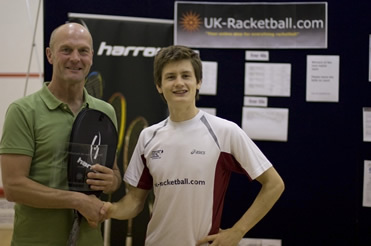 The Semi Finals featured all the top 4 seeds and first on was Neil Chambers against Michael Hennings, again Chambers was hitting the ball well, finding good length on both his straights and cross courts and mixing them in well with fast kills that were dying before the cut line. The other semi final was a repeat from Nottingham a fortnight before with Dominic Hamilton (Nottingham champion) taking on Mark Fuller. After about 5 minutes the score looked like it would be a repeat as well with Hamilton finding himself in complete control of the first game, finding length, holding the ball and making Fuller do all the work, he ended up taking the first game 11/4. In the second however it looked like Hamilton might have thought things were won whereas Fuller looked like he had nothing to lose, after taking an early lead Fuller began to tire rapidly and Hamilton fought back. In the end the game was decided on the tie break with Fuller finally slotting a winner on his agile opponent. By mid way through the 2nd it looked like the match could go either way but some tired shot selection from Fuller and fantastic retrieving from Hamilton proved decisive 11/7 to Hamilton and back to back Harrow UK-Racketball Tour finals for Hamilton. The Final started off looking like a battle between power and speed. Neil Chambers hitting the ball hard and into good areas and Hamilton looking to hold and place the ball whenever he had time. Despite some fantastic racketball from both players in the end it looked like Chambers was not on his best form and things just would not come off as well as he might have expected. Despite taking a small lead 6/5 in the second it wasn’t enough. Hamilton had another good day and in the end came through as an undisputed winner (unlike Nottingham) 11/7, 11/6 and has a second Harrow Tour Title to his name. It will take some beating to get him off the leader board now. Gary Culverwell emerged as undisputed winner of Group A, not dropping a game but Group B had a less simple outcome with a three way tie between James Murphy, Paul Tinnams and Dave Chalton. It took some tense counting (and finding of the score cards) before Dave Chalton emerged victorious by only 2 points and was through to the final. 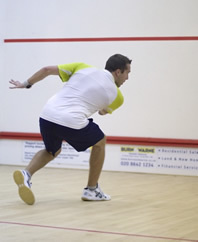 The 3rd 4th playoff was also a close affair with local Andrei Grant taking on racketball old hand James Murphy. In the end Andrei was just a little too quick for him. Speaking to Andrei afterwards he thought he was a little unlucky to play Gary so early as he felt he played much better over the course of the day. He is entering Hunts county at the end of the summer so might be one to watch. Gary Culverwell eventually emerged victorious in the B final against Dave Charlton, this is Garys second Harrow Tour tournament but his first final and after just signing up for the whole series it could be the first of a few. On the day he had also played 2 events meaning he had been on court for over 3 ½ hours! Great effort. This was a much stronger field than in Nottingham with 12 players and plenty of talent and guile. The field was split into 4 groups with a seed heading each group. Rob Watkins (Nottingham Champion), Steve Wall (National over 45 runnerup), Mark Steeden and local Esporta champion Buzby Williams. Top seed Watkins and second seed Wall came through the first round comfortably with neither of them dropping a single game. 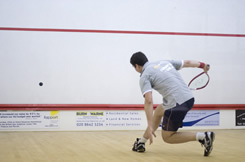 However struggling to make the quick transition from squash to racketball Buzby suffered an early defeat at the hands of Patrick Ozborn in one of the great games of the day. One of the reasons why the best of three format works so well is that there are no dead games that don’t mean anything, you need to be out off the blocks quickly because 1-0 down can feel like 2-0 down does in a best of 5. The early defeat meant the local could not recover in the end finishing 7th. In the semi final once again Rob Watkins lived up to his impressive form comfortably seeing off Patrick Ozborn in straight sets. The other semi between Steve Wall and Mark Steeden was one of the great contests of the day. Steve the no.2 seed took the first game comfortably 11/4 playing incredibly consistent racketball and only making one mistake. The second was a different story, it looked like Wall was tiring as his shot selection became progressively more aggressive, he was trying to finish the match as quickly as he could and was beginning to make mistakes. In the first game there were almost no boasts or volleys from Wall but now he was playing shots that were not quite on and his ratios of winners to tins began to creep towards 50/50. By midway through the game it looked like both players were exhausted with neither having the strength to create a lead. 6/6, 7/7, 8/8 (good Australian Cross Court from Steve Wall) 9/8 then a bad tin 9/9, 10/10 and by this stage Steeden was being as negative as Wall, neither were giving the other an inch. The tie break was a real physical and mental battle, whoever was on top and had game ball was looking for the winner and whoever was behind was digging in and refusing to make a mistake. At 11/10 Mark hit a rare volley into the tin, then at 12/11 Steve hit a reverse angle boast into the floor, at 13/13 there was a 3 minute rally that ended in a let and this seemed to finish Wall off with Steeden eventually closing the game out 15/13.After the drama of the 2nd the deciding game was a bit of a letdown. As is so often the case it is difficult to start the next game when you win the previous one so narrowly and Wall shot to an early lead eventually leading 10/6 before some consistent play from Steeden saw him fight back and almost force a tie break eventually losing the game 11/9 and the match 2-1. In the end it looked like the final of the over 40s was really decided in the semi. Wall still looking tired tried to dig in against Watkins but just didn’t have anywhere near enough. 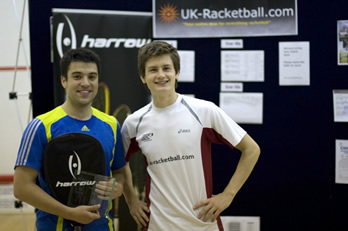 With Watkins eventually winning the final everyone had waited to see quite comfortably 2-0. 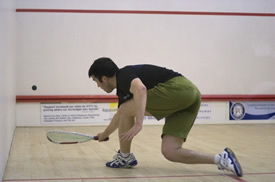 Rob Watkins is hitting impressive form and with 2 Harrow Tour Titles behind him will be tough to catch, he also has his eye fixed on a national title and at the moment is definitely the man to beat in the over 40s. This was played in a one box league with a round robin format with Mike Philips once again emerging victorious and claiming his second title. His toughest match was in the morning against Roger Monteil where he dropped the 1st game only to level and then once again go down in the 3rd 5-1 and have to fight back to avoid defeat. Mike completes the trio of winners who have come from Nottingham and added the Surrey crowns to their collection. The over 50s also contained our first age group ladies entry who without any competition for the ladies crown said she would be fine taking on the men, when I spoke to her before she left she said she had had a great day and despite not winning any game had played loads of racketball and had a lot of fun.